As you may know, I have been focussed on building out my most successful new initiative, the Profit Hunter Pro. A system that trades only fundamentally sound stocks. And where do I get these fundamentally stocks from? My collaboration with Equitymaster researchers has become so greatly influential to me now that I see massive opportunities they can bring to you, my readers. I believe these opportunities MUST be part of your daily reading. So today, I am writing to bring you something newer...and better. Every day of the week you will get a new idea... but not just from me. From every type of investment that can help you seek those market-crushing returns with your investments. Rahul Shah - and his Sensex-beating 'systems'. You might have heard of Rahul's most successful service, Microcap Millionaires, that can beat the Sense 2x - and has been doing so for almost four years now. By using a brilliant system. His belief in systems is not arbitrary (that would be oxymoronic!). He believes in systems because he has been trying them - with extraordinary success - in his decade-long career in the stock markets. As a chartist, I believe in patterns and systems too. And I believe that the right system can help you dig out the best opportunity in any market. That's why I think you ought to hear more about Rahul Shah's systems. Check out his Sensex-beating service too. Rahul Shah is the ultimate Profit Hunter - and under his editorial leadership - the newsletter is sure to flourish. 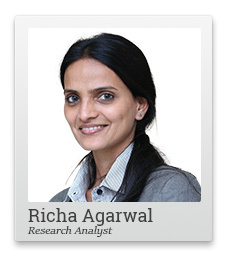 Richa is a boots-on-the-ground research analyst. She criss-crosses the country - travels the length and breadth of India - to unearth those hidden gems of companies whose managements shine with ability, whose moats stretch wide, whose products dominate... and whose numbers outnumber the average. Tell me these numbers don't make your eyes pop a little bit. How many 'multi-baggers' is your portfolio bagging? The service is, in fact, celebrating its 10-year anniversary next week. You'll hear more about it then... keep an eye out for it. Now, as you know, when it comes to stock market investments, I play the long game. But I bring you a man who can play the short game - better than anyone I have ever met. I've written often about cryptos...because they are fascinating. Because they throw up patterns that are changing the face of wealth and investments. Prasheel Vartak has created a course and a newsletter sharing insights on what is really going on in the crypto world. Is there real opportunity there? In fact, you will receive his keen insight on the new platform, this purely Profit Hunting newsletter. Now, usually you can only get his ideas by subscribing to Prasheel's own fantastic newsletter, Crypto Confidential. But, as a personal favour to me, he will write to you here once a week. And, of course, I bring you my own ideas. Once a week, I will write on the new Profit Hunter platform. As you know I look for patterns - where others are only guessing about the markets, I chart out the market's paths. If you wanna bag profits today, tomorrow... this year? Dip into some of my chart magic. You can try it out here. You will receive this new profit-hunting newsletter starting next week from a new address... profithunter@equitymaster.com. Add this new address to your address book - because I do not want you to lose these ideas. So, hope to see you next week, then? With a new profit hunting idea... every day of the week. PS: To whitelist the newsletter's new address, just add profithunter@equitymaster.com to your address book and look for us next week. We request your view! Post a comment on "A Better 'Profit Hunter' For You...Now Every Day". Thank you for posting your view! 1 Responses to "A Better 'Profit Hunter' For You...Now Every Day"